When you added a set of kitchen screwdrivers and a pair of pliers into your home toolbox, you probably didn’t know exactly how you would use them, but you wanted to have them around, just in case. Same thing goes for great Mac OS utilities. FileXaminer is an indispensable tool you can use to edit file information and access privileges. You might not need it today, but the next time you have a problem opening or deleting a file because of permission problems, or you need to peak at its hidden attributes, you’ll be glad FileXaminer is in your toolbox. FileXaminer is basically the Finder’s Get Info command on steroids. It adds other file management features, including super delete, and force-empty trash. Most of the features in Get Info appear when you open a file or folder with FileXaminer, with options for editing permissions, dates, and icons added. You have complete control of permissions at the UNIX file system level (though the FileXaminer interface is easy enough for non-UNIX geeks to understand), the ability to change creation and modification dates, and the ability to set user and group ID bits. FileXaminer’s batch mode gives you the ability to edit attributes for groups of files. Though FileXaminer is an application—you can work with files or groups of files from within it—its features are also available via keyboard shortcuts, the Dock, or contextual menus, giving you quick access to its advanced features. The app manages several attributes that lend themselves to batch mode. 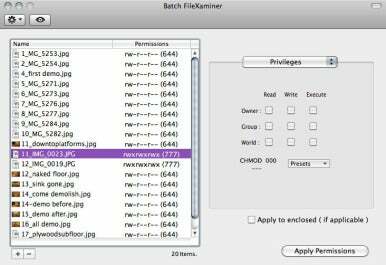 To change ownership, lock/unlock status, creation/modification dates, or custom icons, just select the files you want to work with in the application or in the Finder and use the FileXaminer keyboard shortcut to enter batch mode. You can even select a subset of the file batch, and change the smaller group’s attributes separately. The UNIX file system underneath Mac OS X allows you to create user groups, with ownership privileges for files or folders you select. But to create new groups, you have to navigate Apple’s complex NetInfo tool. It’s far easier to create groups in FileXaminer, and assign access permissions accordingly. Anyone who spends time in the Finder’s Get Info window will find FileXaminer’s attribute- and permissions-editing features a must. Troubleshooters will love features like force empty trash and super delete when working with problematic files.